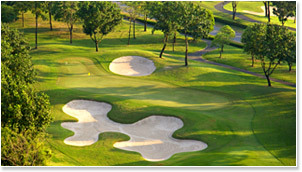 Rajpruek Club proudly presents our spectacular world class standard 18-holes golf course. 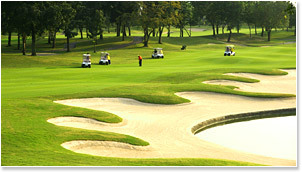 Discover one of Asia’s most exclusive Private Golf Courses and bring your golf experience to a new higher level. Located in the heart of Bangkok, featuring the finest 18-hole private golf course, designed by J. Michael Poellot provides a challenging but fair round of golf for every member and guests. 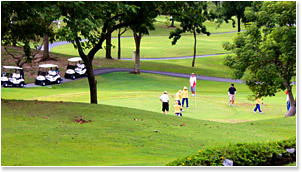 The Par 72 International standard golf course is set in natural parkland and hilly shaped landscape, and can be played from 4,980 yards to 6,565 yards. Our practice facilities include a chipping and putting greens located next to the club house. At the foot of the 18th green you will find the spectacular and exclusive club house. Experience delicious and well prepared meals in the cosy and elegant atmosphere restaurant, or enjoy cold beverages at the spacious patio. The club house features a range of function rooms and a breathtaking terrace balcony over viewing the golf course. The club house is the perfect place for hosting formal dining and smaller more intimate functions.